Halloween is a spooky time of year. That’s basically the entire point. But while we know this scariness is all in good fun, our dogs never got the memo. Try to imagine if you were completely unaware of Halloween, and then one day you woke up and everything was covered in plastic skeletons, bats, and cobwebs, and everyone was dressed up as monsters. It would freak you out! Plenty of dogs find Halloween among the most stressful days of the year, because of the constant stimulation and all the strange-looking people. But you can help manage their night so they’ll find everything more enjoyable. If your dog is showing signs of being frightened or nervous, you can try some of these tricks. A new toy is a great way to distract your dog in general, so it is a logical first choice when there is all-out chaos going on outside. While a toy might not be enough to calm down every dog, it’s worth trying as a first measure. Try a dog puzzle or a toy with a treat or treat paste hidden inside, and your dog will be more engaged with getting at the tasty treat. If your dog is getting worked up because of all the hustle and bustle outside, try leaving the TV or the radio on to help drown out the sounds of trick-or-treating. All around great tools for distraction, these wonderful devices might just help your dog forget that they were scared in the first place. If all the people walking around in costume are starting to freak out your dog, consider closing the blinds to remove that negative stimulant. Out of sight, out of mind. Is yours a dog who gets excited when they hear the doorbell? If so, the constant ringing by trick-or-treaters can leave them burnt out. If you think this an issue, go ahead and disconnect your doorbell, leaving a sign asking people to knock. Or taking turns with your family members sitting in front of your house with candy for the trick-or-treaters will eliminate this issue entirely. Clearly, some Halloween costumes are scary. They are supposed to be. But to a dog, even some of the cuter costumes are terrifying. Some dogs just cannot deal with their people wearing masks, unable to comprehend the fact that behind that rubber mask is the person that has been feeding them for years. 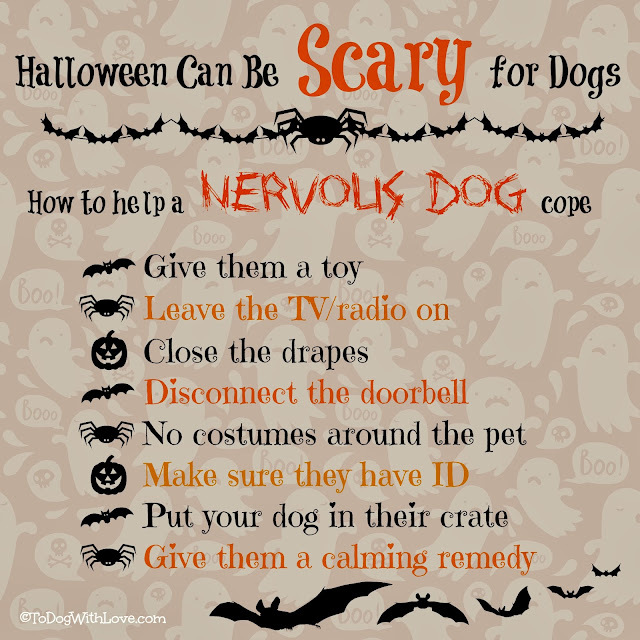 If you notice that your dog is scared of your costume, be a sport and take it off when you are around them. Dogs on Halloween can get scared, that much is clear. When dogs get scared, sometimes they run off. If you sense that your dog is at risk of bolting, make sure they have their tags on (even if they are also microchipped). With all the opening and closing of the door, and all the extra stimuli, there are plenty of opportunities for them to jet. If all the hoopla starts to be a bother and you are having a hard time keeping your dog from bouncing off the walls or shaking from fear, the best thing for everyone is to simply remove them from the situation. This may mean it’s time to put them in their crate, with their food, water, and a toy, and make sure they are away from the noise. If your dog is not the chew-everything-when-nervous type, perhaps simply closing them in a room they can call their own for the night will do the trick. Be sure to check in on them with cuddles throughout the night. If all else fails, or if you are worried that your dog may do harm to someone (or themselves) as a result of their fear, you can go to the vet and get something to help calm their nerves, like a sedative or homeopathic calming remedy. Medical sedatives and tranquilizers are probably only for extreme cases, but for some dogs who have real trouble, it’s a way to ensure that everyone has a fun, safe Halloween. Sam Bourne is a writer and blogger for PetCareRx and The Wet Nose Press. A dog-person at heart, he currently lives with two cats (Pumba and Suzya), but hopes to adopt a pooch soon.